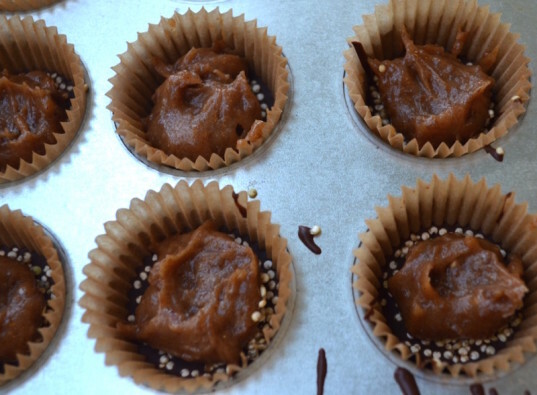 Giving beloved childhood comfort foods a healthier twist is a passion of ours, so we decided to put our own spin on the classic chocolate and peanut butter cup candy. In our version, two layers of chocolate are studded with quinoa — in between is a gooey, creamy salted caramel-like filling made from dates and almond butter. The taste is more sophisticated than the typical, admittedly addictive peanut butter cups. 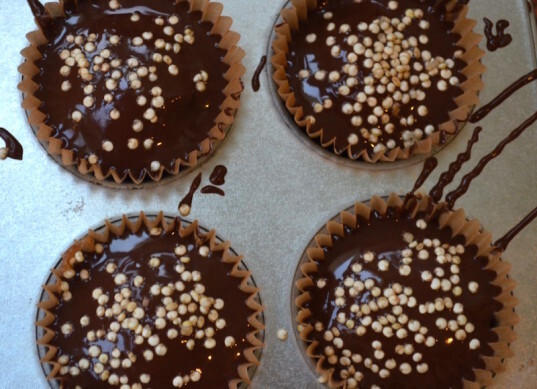 The lightly salted filling cuts the chocolate’s sweetness and the quinoa adds some protein along with texture. This recipe makes 6-7 large cups or about 12-14 mini cups. I made the large cups first to resemble the more traditional peanut butter cups my family loves, but I actually prefer the mini cups. They are the perfect two-bite treat for when you want a decadent dessert without sugar or chocolate overload. These goodies can be stored in the refrigerator or freezer once they harden. If storing in the freezer, I would recommend letting them sit out at room temperature for about 10-15 minutes before serving — (frozen chocolate can get really hard)! Consider this dessert a gateway food for the quinoa-averse. Soon you’ll be adding the protein powerhouse to falafel, risotto, and breakfast bowls. 2. Wash and toast the quinoa. Quinoa has a bitter outer coating that is easily removed by rinsing the grains. Put quinoa and some water to cover in a small pot or container and swirl the quinoa around. Drain the quinoa as much as possible. To do this without losing too many grains, I use a pot with a tight lid and turn it almost upside down so that the water drains and the quinoa stays inside. Place cleaned quinoa in a small saucepan and turn the heat to medium. 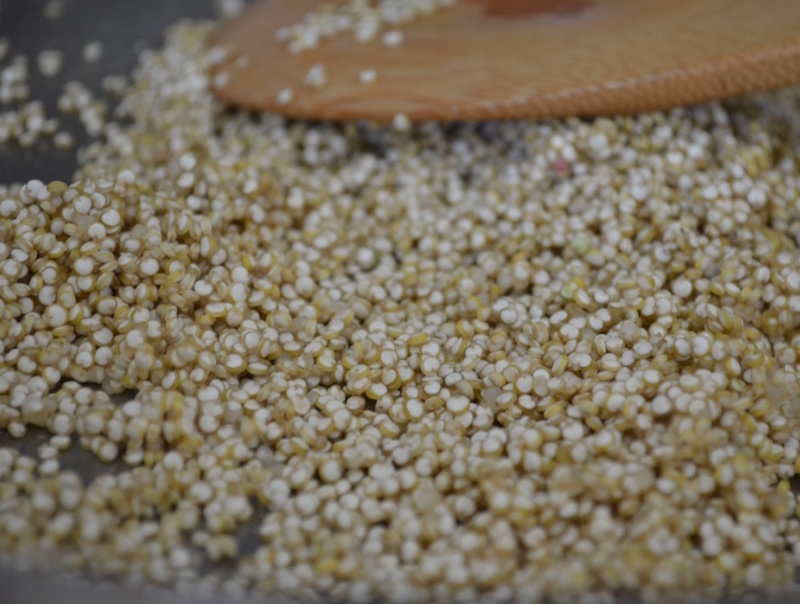 Let the quinoa grains cook until they are dry, start to pop, and darken in color slightly, about 6 minutes. While the quinoa is cooking, line muffin/cupcake pans with liners. Remove the quinoa from the heat and let cool. 3. Melt the chocolate chips and coconut oil together. 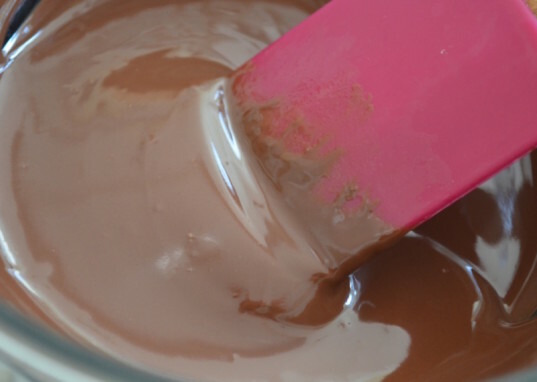 Using a double boiler, melt the chocolate chips and the coconut oil together until you have a shiny, smooth mixture. 4. Coat the bottom of the cups. Carefully remove the bowl from the heat and use 1 tsp of the chocolate yumminess to coat the bottom of each mini cupcake liner. If making the large cups, use about 1/2-3/4 Tbsp. You don’t want a super thick layer of chocolate, but you want to completely cover the liner’s bottom. You also should have quite a bit of the chocolate left for the top layer. In the event that you don’t, simply melt some more chocolate chips with a little coconut oil. 5. Sprinkle on the quinoa then freeze. 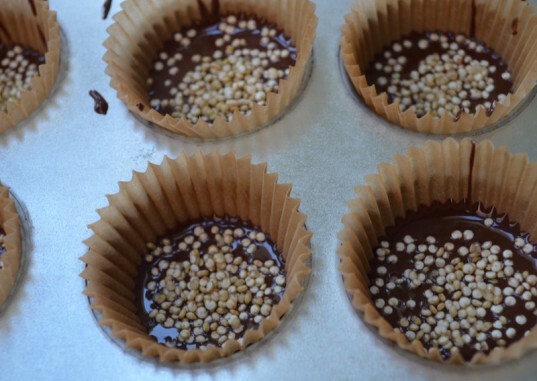 Sprinkle on a single layer of quinoa to the chocolate and then place the cups in the freezer for about 10-15 minutes to harden. If you have quinoa skeptics in your house, you can sprinkle on less or leave the layer out, but it adds some delicious, crunchy texture. 6. Make the salted date caramel. 7. Add the salted date caramel layer to the chocolate cups. Take the cupcake/muffin tins out of the freezer. Spoon about 1/2 tsp of the salted date caramel (or about 1/2 Tbsp if making the large cups) over the now-hardened chocolate layer. 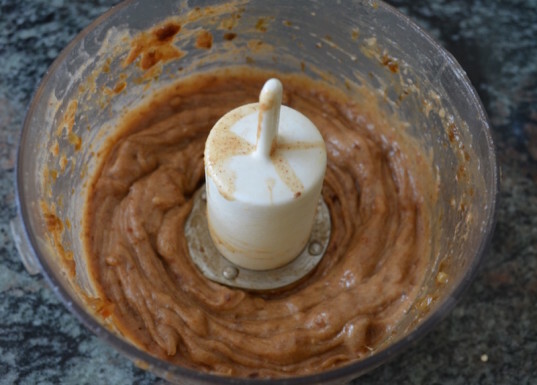 Use clean fingers or a spoon to press the caramel into an even layer. 8. Cover with more chocolate. 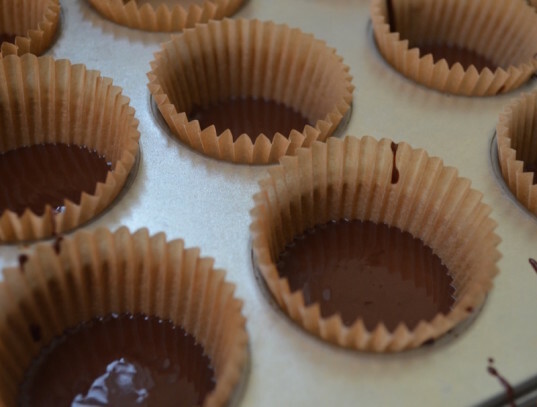 Add more melted chocolate to cover the cups (start with 1 tsp for mini cups and 1/2 Tbsp for the regular size, adding more if needed to cover). Sprinkle more quinoa on top for decoration and extra crunch. Return to the freezer for at least 15-20 minutes to harden again. Once the cups have hardened, serve and enjoy! Keep any leftovers in an airtight container in the freezer or refrigerator for up to a week (although we doubt anyone can resist these cups for that long). 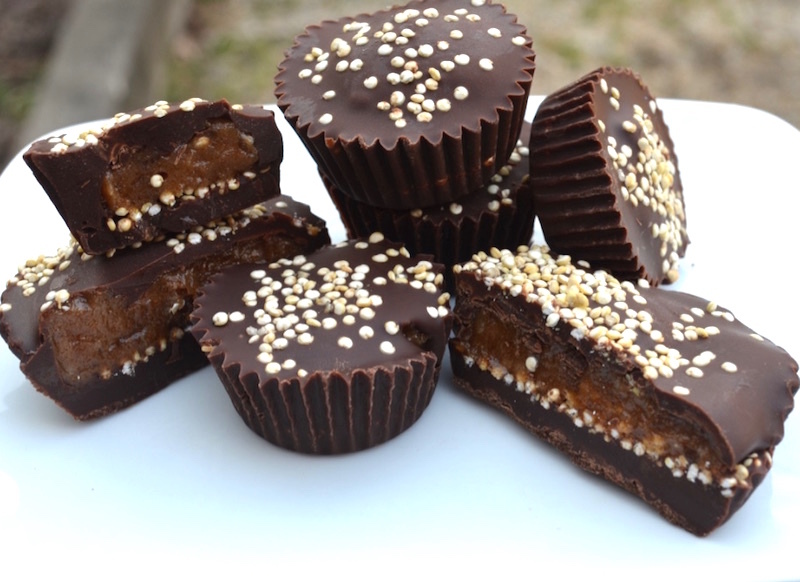 Giving beloved childhood comfort foods a healthier twist is a passion of ours, so we decided to put our own spin on the classic chocolate and peanut butter cup candy. In our version, two layers of chocolate are studded with quinoa -- in between is a gooey, creamy salted caramel-like filling made from dates and almond butter. The taste is more sophisticated than the typical, admittedly addictive peanut butter cups. The lightly salted filling cuts the chocolate's sweetness and the quinoa adds some protein along with texture. This recipe makes 6-7 large cups or about 12-14 mini cups. I made the large cups first to resemble the more traditional peanut butter cups my family loves, but I actually prefer the mini cups. They are the perfect two-bite treat for when you want a decadent dessert without sugar or chocolate overload. These goodies can be stored in the refrigerator or freezer once they harden. If storing in the freezer, I would recommend letting them sit out at room temperature for about 10-15 minutes before serving -- (frozen chocolate can get really hard)! Consider this dessert a gateway food for the quinoa-averse. Soon you'll be adding the protein powerhouse to falafel, risotto, and breakfast bowls. Carefully remove the bowl from the heat and use 1 tsp of the chocolate yumminess to coat the bottom of each mini cupcake liner. If making the large cups, use about 1/2-3/4 Tbsp. You don't want a super thick layer of chocolate, but you want to completely cover the liner's bottom. You also should have quite a bit of the chocolate left for the top layer. 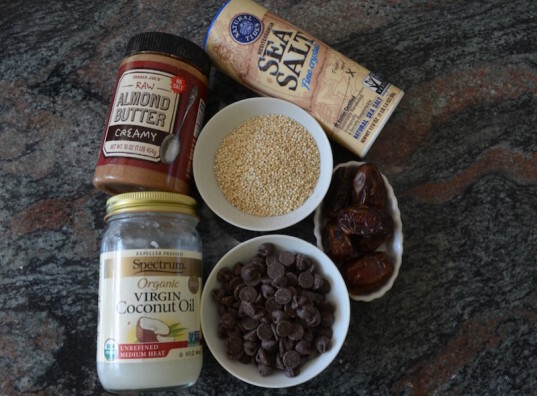 In the event that you don't, simply melt some more chocolate chips with a little coconut oil.